Filming a sequence that's believed to form the climax of a chase scene for the new Bond film "Quantum of Solace," Daniel Craig and the rest of the Bond crew deliberately crashed an Aston Martin DBS into an Italian quarry. That crash should conclude a 15-minute pre-title credits scene in which Bond is pursued through the Italian Alps by bad guys in Alfa Romeos. 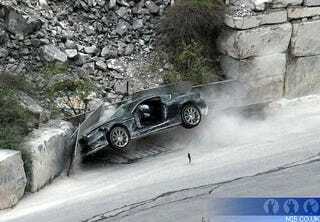 All of the previous inadvertent crashes, the degree to which the Aston appears destroyed in these photos and the elaborate filming taking place at dramatic locations across Italy point to this chase sequence being a doozy.